There is no doubt that until recently there was a powerful concern that in nations such as the US, parts of South America, and the EU (especially in Germany), renewable biofuel production would reduce food available to eat. The result would be rising food prices for us all. For a while, governments were so keen to encourage renewable fuels, to reduce climate-changing emissions that they seemed to forget that people must come first when food is needed. "Crops Used for AD raise the price of food", and that "People could go hungry as a result". But, this was not primarily aimed at biogas production. The technology used for the original diesel-fuel-replacement biofuels, which were widely subsidized was, and still is, the chemical conversion of vegetable oils into bio-diesel. This is a diesel fuel replacement which is added to the fuel bought at filling stations, and lots of it is still produced. The production of biogas using the anaerobic digestion process is a completely different process. AD processes once received subsidies for crops such as maize and beet as well as agricultural biomass waste and, in parts of the EU. As a result of the spin-off from the main biodiesel "Food-for-Fuel" debate, such subsidies have all-but ceased. They are now historical and are no longer granted. Unfortunately, anaerobic digestion and biogas has become erroneously tarred with the same "Food versus Fuel" brush. This is wrong in our opinion. When crops are grown for AD, this is usually done as part of a traditional agricultural rotation, helping farmers to improve food crop yields and soil quality, or these are grown on marginal land not suitable for food crops. The amount of land used for growing crops for energy generation in England is less than 1%. This figure is even lower across the devolved nations of the UK. More land is used for golf courses. The ADBA analysis also shows that the growing of these crops has had no discernible impact on food supply for humans or livestock. The following are just some of the reasons to support the agricultural production of biogas fuel, when based upon using crop and other waste. AD has a vital role to play in recycling wastes, reducing greenhouse gas emissions, and producing the renewable energy, clean transport fuel, and soil-restoring biofertiliser that the UK desperately needs. 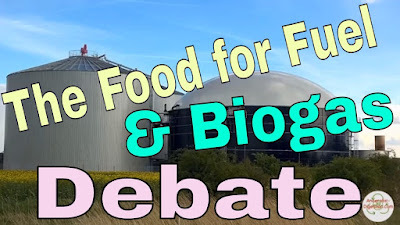 For another article about biogas myths including food for fuel subsidies visit here.